17/1/12 - Acquisition - Vic-sur-Seille, Musée départemental Georges de La Tour - The painting attributed to Simon Vouet (ill.), a portrait of a woman representing perhaps his wife Virginia Vezzi , which the Musée Georges de La Tour wished to add to its collections thanks to a fundraising campaign (see news item of 22/6/11 in French), has finally been purchased by the Conseil Général de Moselle and now hangs in the galleries. 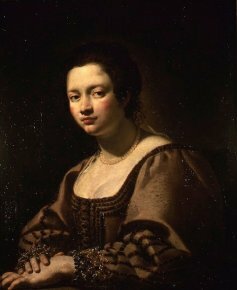 Although the attribution is not unanimously accepted, the work is of fine quality and obviously corresponds to Roman circles of the 1620’s, close to Vouet. Initially offered for the price of 500,000 €, then lowered to 400,000 €, the canvas in fact sold for 150,000 €, most likely due to the doubts surrounding the attribution. About 30,000 € came from the fundraising which is not yet over, with some local firms still contributing. Once again, this operation proves that these appeals, addressed to the general public for the acquisition of a specific work by a museum tend to do well in achieving their goal. And not, as stated until recently - as we ourselves did in the previous news item concerning this painting - Virginia da Vezzo or Virginia da Vezzi.